For the Love of Discipline: When the Gospel Meets Tantrums and Time-Outs, by Sara Wallace. P&R, 2018. Paperback, 160 pages, $10.00. Reviewed by RPCNA member Cheryl DeGraaf. 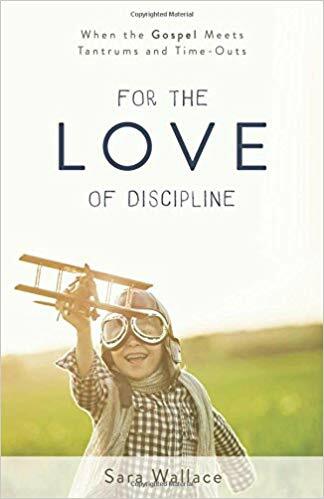 In her book For the Love of Discipline, author Sara Wallace reminds us that disciplining our children is a beautiful privilege we should embrace and cherish as parents. To those frustrated and exhausted from the daily mayhem of parenthood, she shines the hope of the gospel, gives solid encouragements to persevere, and provides practical helps for letting the gospel transform our parenting. Wallace defines gospel-centered discipline as shepherding hearts, training minds, and cultivating a loving relationship with our children that points them to Christ. This means we should welcome it. The goal of discipline is to conform us to the image of Christ, and we know from our own lives that this is a slow process. If we look for quick fixes to our kids’ sin issues, we will become frustrated. We are tempted to dish out a quick punishment and return to folding laundry. Yet, we are called to shepherd our children and look to why they acted as they did, not just what they did. Wallace counsels parents to have patience, wisdom, and hope as we look forward to the good work God will accomplish in our children. We discipline today because consequences of our children’s disobedience could cost them more than a time-out in the future. Finally, Wallace reminds us that obedience to God yields blessings because of his good character, not ours. The second part of her book focuses on specific discipline strategies and practical tools. Wallace has five young boys, and her strategies focus on the younger years. I found her discussion about structuring her day and developing the fruit of the spirit particularly helpful. For instance, she writes that because they eat similar breakfasts most days of the week, she uses that time to look for thankfulness and contentment. Since lunches have more variety, she uses that time to develop politeness and self-control. This intentionality can help us focus our role in our children’s lives, and develop those mindsets in ourselves as well. Wallace quotes a wealth of authors, which adds depth to her arguments. She continually encourages us to be faithful and leave the results to God. For the Love of Discipline should cause us to look afresh at our children and our God-given role as parents and to embrace the challenges and joys before us.